Young and tender green beans are in the markets right now. Typically we steam them until just soft and simply dress them with extra virgin olive oil, salt and pepper. This has such a lovely combination of textures and flavors with the soft scrambled egg, tender green beans, spicy jalapeño and nutty pecans. I found this recipe skimming through a 2011 Food & Wine magazine. Apparently, this is a Georgian dish called lobio (bean dish). The Georgian word ‘lobio’ means ‘beans’ and there are a number of varieties of lobio dishes. This green lobio dish is typically served cool, but with its buttery scrambled eggs and tender green beans, it’s equally delicious hot. We served it warm and it was wonderful. In a pot of boiling salted water, cook the green beans until tender, 6 minutes. Drain and let cool. Transfer to a bowl. In a large skillet, melt the butter in the oil. Add the onion and cook over moderate heat, stirring, until softened, about 6 minutes. Add the eggs and season with salt and pepper. Cook over moderate heat, stirring, until the eggs are scrambled, about 3 minutes. Add the eggs to the beans. Stir in the chopped cilantro, pecans, garlic, jalapeño, red chile and dill seeds. Season with salt and pepper. Garnish with cilantro sprigs just before serving. 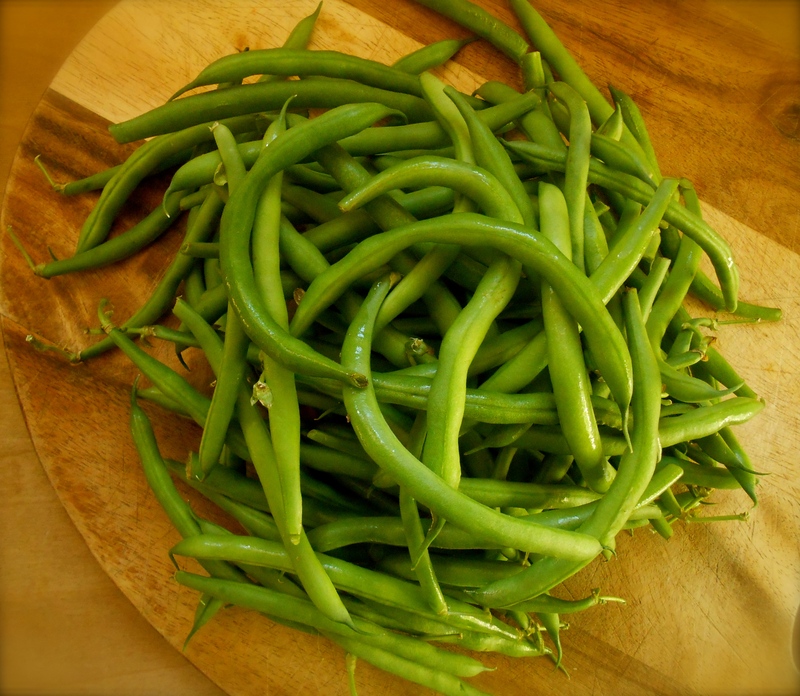 What a wonderful recipe…lots of green beans in the farmer’s markets…such beautiful photos you have of this classic summer time bean…Thanks for the interesting recipe. My kind of dish. I make something like it often, using whatever beans I have on hand, like chopstick beans or even sea beans. I’m looking forward to getting some tender green beans at the farmers market next week and will try it with the chili and herbs you suggested here. Thanks, Seana! I’m so curious…what are chopstick beans or sea beans? Are they long beans? I love long beans and buy them often at the asian market. 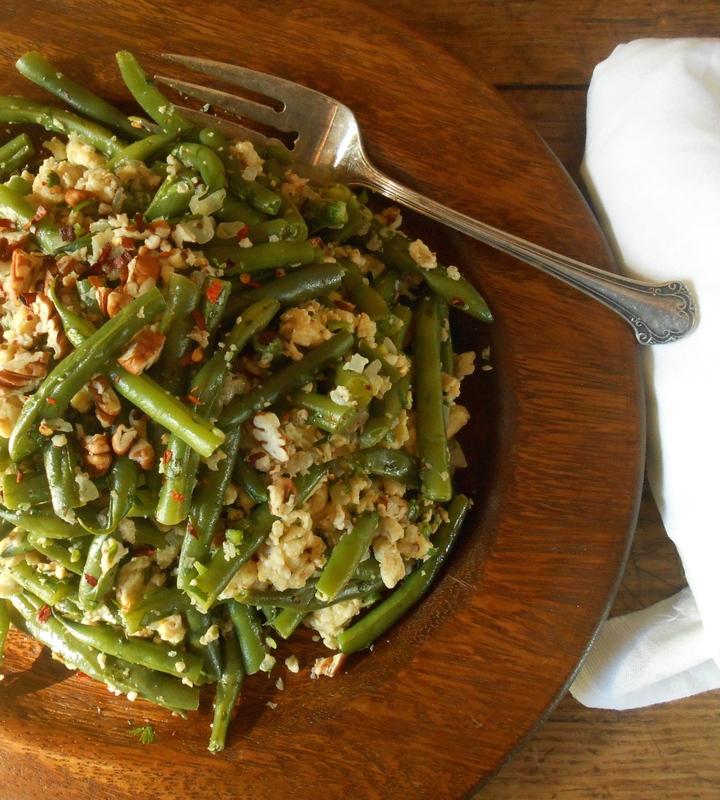 The chili and herbs in this green bean recipe really went well with the scrambled egg. We really enjoyed it as a one dish meal, nothing else needed on the table. :) Thank you Ngan. Always a pleasure hearing from you! Wow. What beautiful photos and what a great recipe. The first thing I ever made was Georgian. I believe I may have roots there. I absolutely love that this has jalapenos and red chilis, cilantro and dill seeds.. But the killer for me is always the egg. That elevates this from good to great. I’m totally making this tonight as my side. Love it. I am so unaware of Georgian food Amanda. I found this recipe and was so taken by the ingredients I just had to make it. Now I’m intrigued about Georgian food. What did you make that first time? Well it looks amazing. I was in college and it was a chutney of sorts with nuts in it. My friend had Georgian roots. It was such a long time ago. Now you have me wondering. I’ll have to look up some other recipes. But I’m pretty sure we made a chutney and bread. we are on a huge egg kick in our house. My hubby loves green beans, you just gave me my next dinner idea, thanks! Interesting. We must be on a egg kick too because every time I turn around the carton is empty and I’m heading to the store for more! Lately I love to slow cook an egg in a skillet with a little olive oil. It’s delicious! Thank you Prudy! Your Mike certainly is picky…isn’t he! :) You are such a good mom to make adjustments to his portion. (I would do the same thing, quite frankly) It is always so nice to see your presence here. Love this I am always looking for different ways to use green beans, they are so plentiful now at the green market. Love this spicy kick and eggs really gorgeous, love the recipe and the photo’s are so beautiful. 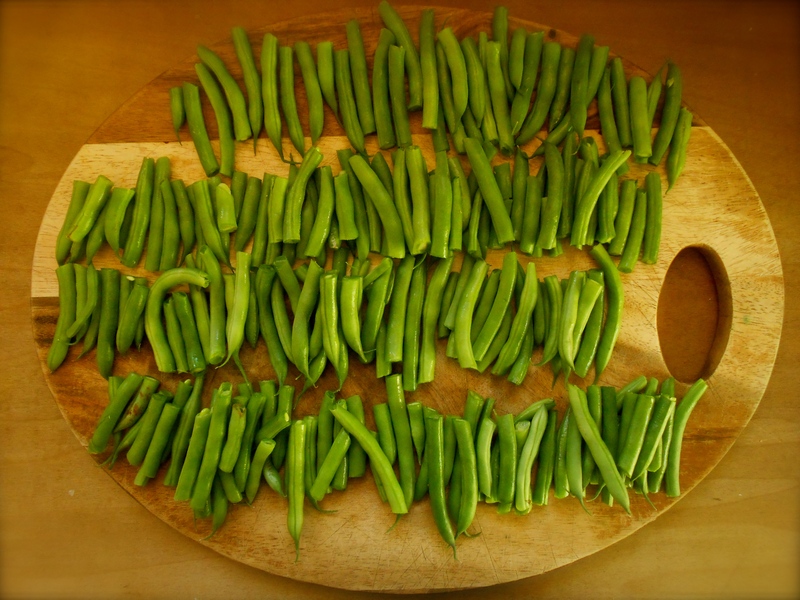 I was so happy to find the most beautiful pile of crisp green beans at the market the other day. I had this recipe tucked away so it was a perfect opportunity to give it a try. It’s really delicious Suzanne. What an interesting recipe Seana, i’ve never seen anything quite like it, but eggs, beans, it must be delicious. Maybe this will spark an idea for you? I used to always cook the egg first, then add the rice. Not any more. As for a dressing, my local supermarket is selling one made from mango, lime and chillies. With evo oil and white balsamic that might be the way to go. If I can find canned mango. Not so easy here. Will let you know how it turns out. Oh, and not long after the first corn on the cob of the season – too delicious! I like the sound of mangoes, lime and chillies for fried rice! And thank you for the article, good read. I always add the beaten egg directly to the rice and cook it in a skillet. I have a Thai friend who taught me to do it this way. She also told me to always use left over refrigerated rice. She wasn’t far off from the article! Nice to hear corn on the cob is in season there! Have you seen any recipes for “Mexican street corn”? It’s great! Here’s one I saw the other day. I need to make this. Sorry to keep sending you links….I wonder if peaches would be good to use if you can’t find canned mangoes for your dressing? That’s exactly what I’d bought! And I’ve just had the first try out with bean and nut burgers – so, so good. Definitely want to try making it with mango, if I can get those in cans as they’re softer to mash. And I’ll have to try and figure how to purée the fruit without having to run through. Anyway, glad to hear that’s the correct way of cooking egg fried rice. I’m really enjoying it a lot more since I read that article. Love it! I would rather have it warm. Love the eggs for breakfast. This sounds like a great dish for any meal :). Thank you Sonal…a very interesting dish. It was wonderful, we really enjoyed. What a new and interesting recipe for me, Seana. I would have never thought to scramble some eggs with green beans. But then again, if I think about it, I made an egg drop noodle soup with green beans once, so yes, this works! The jalapeno and nuts probably take this over the top in taste! What a wonderful dish, I have all the ingredients on hand, I’m going to make this as a side dish tonight, it’s absolutely perfect. Thanks! Hi Cheri! If you made the green beans I hope you enjoyed them. :) Thank you so much for stopping in, always so nice to hear from you. Damn delicious and comforting friench bean recipe!!! what a great meal :-) Love when veggies get to star. What a great combination of flavours Seana… and it presents so beautifully on your wooden board/bowl! Beans never last long in this house but next time I get some I will guard them with my life so I can make this fab dish. This looks amazing! My husband brought some lovely green beans home from the farmers’ market this morning. I think they are destined to find their way into this delicious dish. Thanks for sharing! You are currently reading green beans with eggs, jalapeño and cilantro at COTTAGE GROVE HOUSE.